As industrialization realizes higher potential in developed as well as developing nations, the global industrial machinery market size is expected to reach USD 771.59 billion by 2024 as per a research report by Global Market Insights, Inc. This clearly indicates that there is a tremendous demand which needs to be bridged by the manufacturer and suppliers in the sector. If you are one of those exploring possibilities in this segment, Blue Mail Media’s Machinery and Equipment Manufacturers list can help you meet the purpose. Our Database gives you access to all information you may need to connect with your target market via telephone, email or mail. 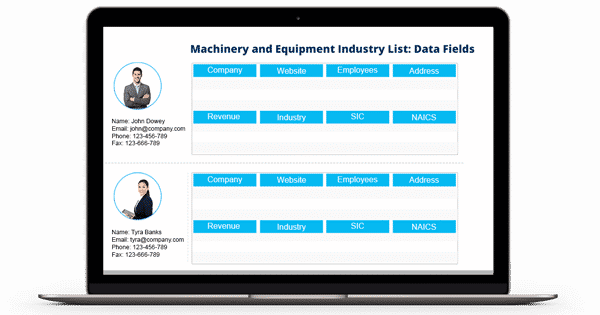 Blue Mail Media’s Machinery and Equipment Industry Email List has been meticulously prepared by our team of data scientists, marketing specialists and professionals. We have put in immense efforts in making sure our database meets the highest quality standards and our clients achieve greater success in their multi-channel marketing campaigns. Over the years, we have been able to build a strong network of data partners that enables us to help clients without any regional constraints. Our data vendors’ network is spread across the US, UK, Canada, North America, Africa, Russia, China, New Zealand, Australia and India amongst many other regions. We provide our clients enough flexibility to choose from our pre-packaged list of Machinery and Equipment suppliers mailing list or get a customized list based on their campaign specific parameters.